Broadly focused on postcolonial childhoods, Dr. Balagopalan’s inter-disciplinary research engages marginal children’s experiences with compulsory schooling, labor, gendered school-spaces, children’s rights discourses and pedagogies of ‘citizenship’. Trained in education and anthropology, her work is directed at both challenging the exclusionary logics that often underlie humanist efforts around marginal children, as well as productively drawing upon these children’s lives to decenter hegemonic assumptions around childhood. 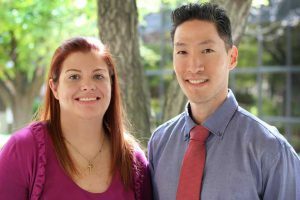 Dr. Balagopalan is currently engaged in two separate research projects. The first of these is an archival exploration of various efforts undertaken to democratize schooling in India from the late nineteenth century onwards. Her effort is to trace shifts in ideas, institutions and technologies set in place, to not only include marginal populations of children, but to also design ‘appropriate’ and ‘meaningful’ curriculum for them. Her second research project is an ethnographic exploration of India’s much touted youthful ‘demographic dividend’ with a particular focus on urban female youth, who are first generation school goers, and the complexities that frame their transitions from schooling to skilling. 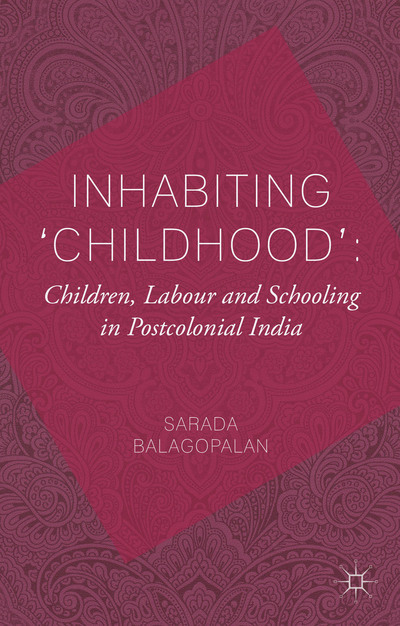 Sarada’s book Inhabiting Childhood: Children, Work and Schooling in Postcolonial India (Palgrave, 2014) foregrounds the tension between children’s work and schooling as a key site where discourses of colonial modernity, the ‘developmental’ nation-state, late capitalism and current transnational efforts around children’s rights play out. Her work has been published in several journals. Sarada’s work has also involved efforts to translate her research interests into curricular and related interventions in elementary education. 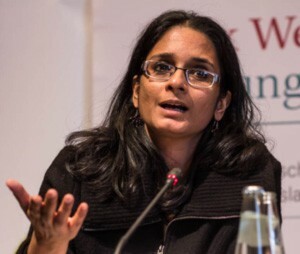 Between 2005-08, Sarada served as the Chief Advisor to the Indian government’s middle-school ‘Social and Political Life’ (earlier known as ‘civics’) textbooks. Dr. Balagopalan is currently a Board member of Nirantar, a center for gender and education in New Delhi, and has also been a part of Eklavya, an NGO in Madhya Pradesh, engaged in pedagogic reforms in India’s public schools. Prior to joining Rutgers University, she was an Associate Fellow at the Centre for the Study of Developing Societies (CSDS), New Delhi. Postcolonial Childhoods; Children’s Rights; Democratization of Schooling; Childhoods and the Politics of Culture; Social Studies Curriculum and the Politics of Identity and Cultural Nationalism; Globalization and Public Schooling; New Social Movements. Inhabiting ‘Childhood’: Children, Labour and Schooling in Postcolonial India. Palgrave, UK, 2014. Member Editorial Team, Educational Exclusion and Inclusion: Policy and Implementation in South Africa and India. London: DFID Series #72, Researching the Issues, 2007. Guest Editor. Special Issue on ‘Childhoods and the Indian Context’ in Childhood: A Journal of Global Child Research. London: Sage. August 2011. “Global/local research on children and childhood in a global society” in Childhood: A Journal of Global Child Research. Participated in a 25th anniversary special Conversation with S. Aitkinson, T. Abebe, and S. Punch, moderated by Karl Hanson. vol.25(3), p.272-296. “Afterschool and During Vacations: On Labor and Schooling in the Postcolony” in Children’s Geographies. Publishied online July, 2018. “On Freire’s Critical Optimism” in Contemporary Education Dialogue. New Delhi: Sage. 8(2), 2011. “Rationalizing Seclusion: A Preliminary Analysis of a Residential Schooling Scheme for Poor Girls in India” in Feminist Review London: Sage, December 2010. “Memories of Tomorrow: Children, Labor and The Panacea of Formal Schooling” in Journal of the History of Childhood and Youth Johns Hopkins University Press. May 2008. “National Curriculum Framework 2005” in Book Review, New Delhi, October 2005. “These children are slow”: Some experiences of inclusion, formal schooling and the Adivasi Child” Perspectives in Education, September 2003. “Neither Suited for the Home nor For the Fields: Inclusion, Formal Schooling and the Adivasi Child.” In IDS Bulletin, Vol.34(1), Sussex: Institute of Development Studies, 2003, p.55-62. “Dalit and Adivasi Children in Schools: Some Preliminary Research Themes and Findings.” Co-Authored with R. Subramanian in IDS Bulletin, Vol.34(1), Sussex: Institute of Development Studies, 2003, p.43-54. “Constructing Indigenous Childhood: Colonialism, Vocational Education and the Working Child.” in Childhood: A Journal of Global Child Research Vol. 9(1), London: Sage, 2002, p.19-34. “Teaching ‘Global Childhoods: From a Cultrual Mapping of ‘Them” to a Diagnositc Reading of us/US’ in A. Twum-Danso Imoh, M. Bourdillon and S.Meichsner (eds.) Global Childhoods Beyond the North/South Divide. Palgrave Studies on Children and Deveopment. Forthcoming. “Childhood, Culture, History: Redeploying ‘multiple childhoods”’ in S.Spyrou, R. Rosen and D. Cook (eds.) Reimagining Childhood Studies. Bloomsbury Academic. 2018. “Colonial Modernity and the ‘child-figure’: Reconfiguring the Multiplicity in ‘multiple childhoods'” in T.S. Saraswathi at al (eds.) Childhoods in India: Traditions, Trends and Transformations. Routledge, 2018. “The Politics of Failure: Street Children and the Circulation of Rights discourses in Kolkata (Calcutta), India” in Karl Hanson and Olga Neiuwenhuys (eds.) Reconceptualizing Children’s Rights in International Development: Living Rights, Social Justice, Translations. Cambridge University Press, 2013. “Unity in Diversity: Diversity, Social Cohesion and the Pedagogical Project of the Indian State” in S.Vandiyar et al (eds.) Social Cohesion, Desegregation and Diversity. Amsterdam: Rozenburg Publications. 2009. “South Asia” in Oxford Bibliographies in Childhood Studies. Ed. Heather Montgomery. New York: Oxford University Press, March, 2013. “Postcolonial Childhoods” in Oxford Bibliographies in Childhood Studies. Ed. Heather Montgomery. New York: Oxford University Press, (Forthcoming). “Colonial Childhoods” in Oxford Bibliographies in Childhood Studies. Ed. Heather Montgomery. New York: Oxford University Press, (Forthcoming). Visiting Fellow, German Historical Institute London (GHIL), (June-July 2014, 2015). Civic Engagement Faculty Fellow, Rutgers University – Camden, Spring 2015. Supervisor, Transnational Research Group “Poverty Reduction and Policy for the Poor between the State and Private Actors: Education Policy in India since the Nineteenth Century” directed by the German Historical Institute London (2012 to date). CRY National Child Rights Fellowship, January 2008. Charles Wallace Trust, Short-term Research Fellowship, London, June 2007. Lead Researcher, DFID Project on “Educational Exclusion and Inclusion: Policy Implementation in South Africa and India”, 2001-2003. Research Fellow, Eklavya Institute for Educational Research and Innovative Action, Bhopal, Madhya Pradesh, 1998 – 2000. Page last updated by Department of Childhood Studies at 9:38 am October 4, 2018 . This page was printed from http://childhood.camden.rutgers.edu/faculty/balagopalan/ at 4:17 AM Friday, April 26, 2019.